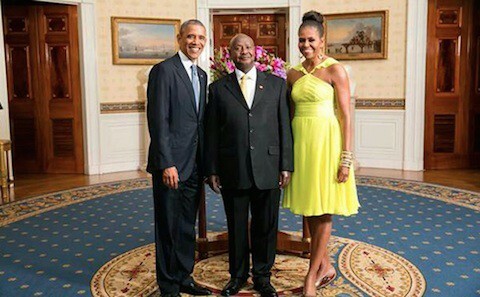 President Obama and first Lady Michelle Obama welcomed Ugandan President Yoweri Museveni to the White House on Tuesday as part of the U.S.-Africa leaders summit this week. Despite announcements in June from the State Department that it would "take measures to prevent entry into the United States by certain Ugandan officials involved in serious human rights abuses, including against LGBT individuals" the man responsible for signing Uganda's Anti-Homosexuality Act (which this week was struck down by that nation's high court on a technicality) into law was not blocked from attending the summit in the nation's capital. Human and gay rights activists have called on Obama to discuss anti-LGBT discrimination at this week's summit. The business forum is part of an unprecedented three-day summit underway in Washington, with nearly 50 African heads of state in attendance including President Yoweri Museveni. Obama was hosting the leaders at a White House dinner Tuesday night. At the meeting, U.S. companies announced $14 billion in investments for Africa. Among them: a $5 billion investment from Coca-Cola to fund manufacturing lines and production equipment; $2 billion investment from GE by 2018; $200 million in investments across Africa by Marriott, and a $66 million commitment by IBM to provide technology services to Ghana’s Fidelity Bank. Obama said with the new financial commitments, he was boosting that goal to 60 million homes and businesses. He also announced $7 billion in new government financing to promote U.S. exports to and investments in Africa. That includes $3 billion in financing from the U.S. Export-Import Bank aimed at supporting American exports to Africa over the next two years.